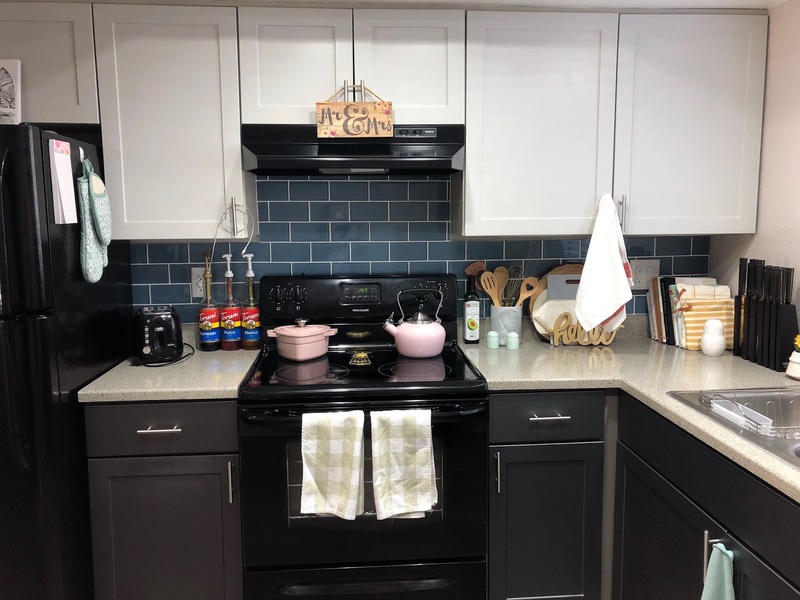 Today I have for you a long-awaited post, the first installment of my apartment tour series; my kitchen. This is the first room in the apartment to be completed (for the most part) and it all came together the quickest. I'm not quite sure why it's taken me so long to share. 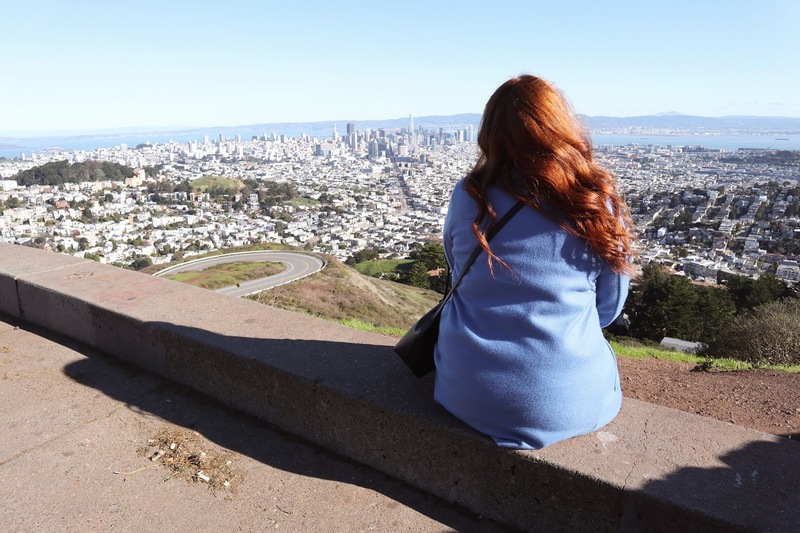 Perhaps it had to do with nerves of sharing something that has been private to Rudy and myself, and possibly I wasn't ready to exploit that into the world. But anywho it is finally here for the public eyes to see. 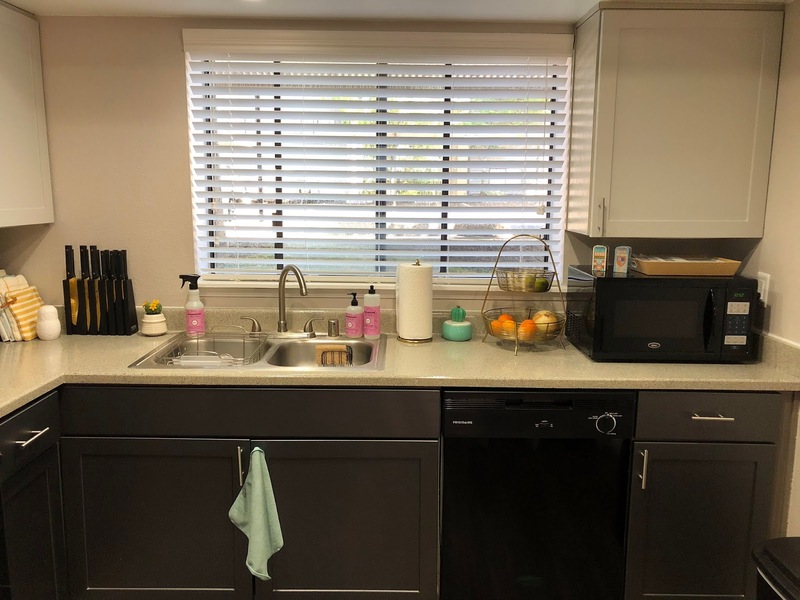 Before we begin the tour, I would like to first welcome you to my kitchen! I spend a lot of time in the kitchen as I cook all of mine and Rudy's meals. We very rarely eat out and probably do 3-4 times a month if that. I love to cook and especially bake so I really enjoy spending time in the kitchen. This is the overview of what my kitchen looks like and it typically always looks like this. I always try to keep things clean, well organized, and in its rightful place. Starting off on the left side, we have the pantry filled with a whole lot of cooking essentials. 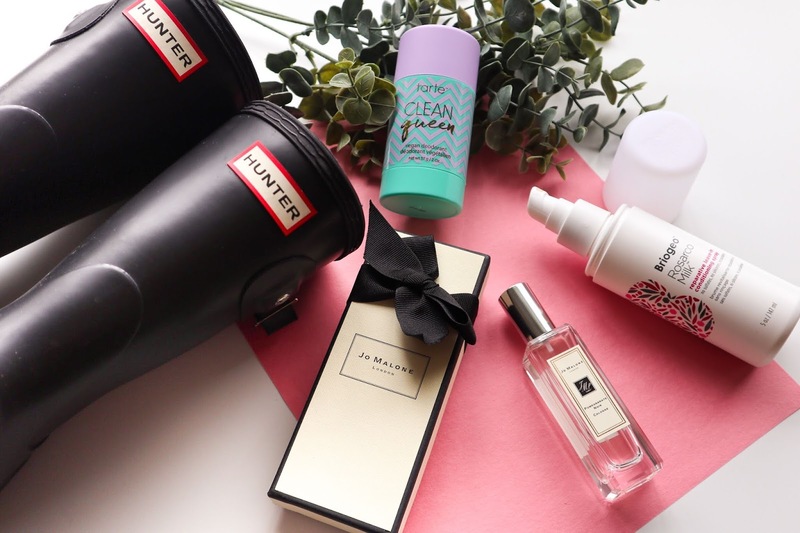 I'm not going to include it in this post because it's not up to my aesthetic standards and I'm planning on completely organizing it. Maybe then I can dedicate a post entirely to it in the future, we'll see. Next, to the pantry, we have our fridge. Above I have an Alice in Wonderland painting that was only supposed to be a temporary spot for it, but now I really like having it there. I also have my matryoshka hanging out up top until I figure out where I want to put her. On the fridge door, I have a few photo strips of Rudy and myself that we've taken through the year in photobooths. It's become a little tradition of ours to take a photo every time we find a photo booth. I printed out a few pictures of us during our trip to the Museum Of Ice Cream. 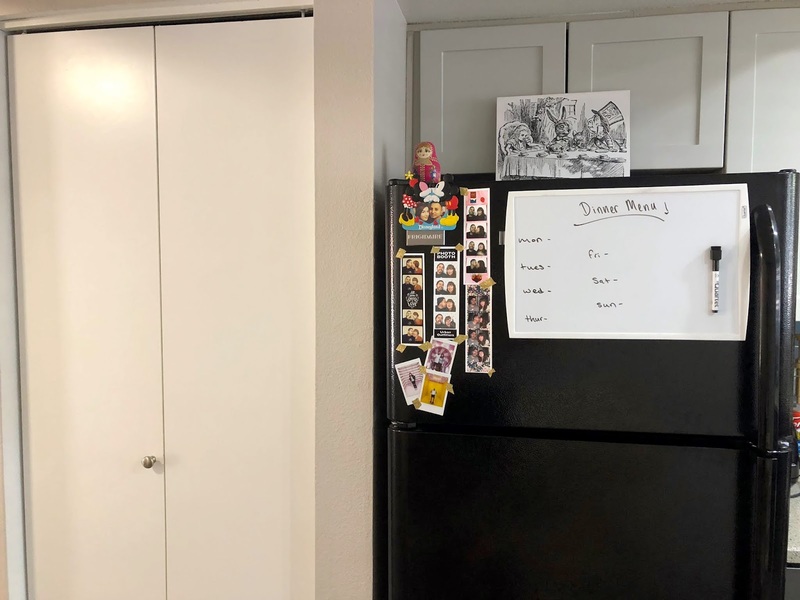 I also have one of two Disney items in my kitchen, a kissing Mickey and Minnie photo magnet that I bought I believe the first time Rudy and I went to Disneyland together. Inside, of course, I have a photo of the two of us together at Disneyland. 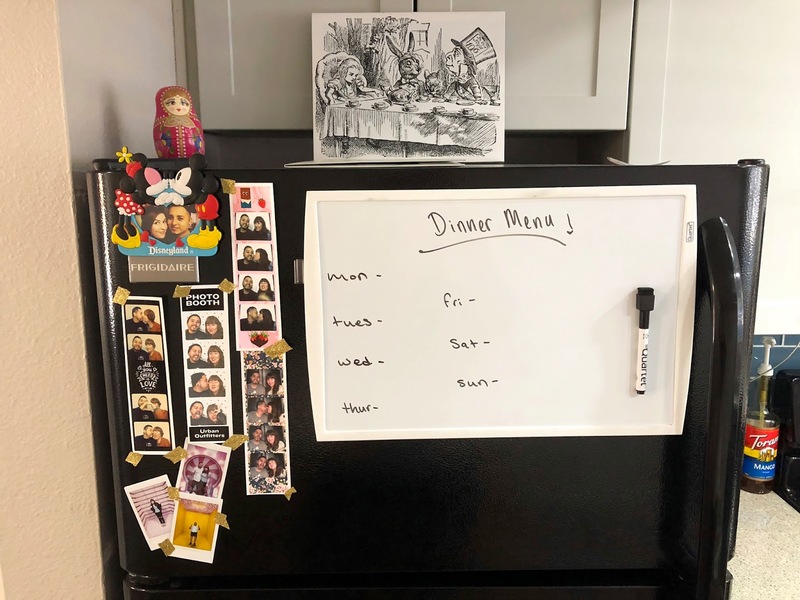 Lastly, I have a dry erase board where I like to keep track of what I'm going to be making for dinner throughout the week. This has become super handy because some days I will forget something specific I wanted to make and only remember once I'm about to sit down for dinner. On the side of the fridge leading up to the next photo, I have my oven mitts hanging for easy access, and I have a magnetic notepad for writing down our grocery list. Continuing further down, you will see a bunch of cabinets and my stove. Above the stove hanging on the handles of the cabinet, I have a Mr & Mrs rustic sign that Imelda gifted to me after Rudy and I got married, which I love. To the left of the stove, I have my toaster, of course, to make my avocado toast every morning. Next, to that, I have some flavored syrups that Rudy and I use in a lemonade and sprite drink we make. It's so delicious and super refreshing. My favorite is the raspberry. 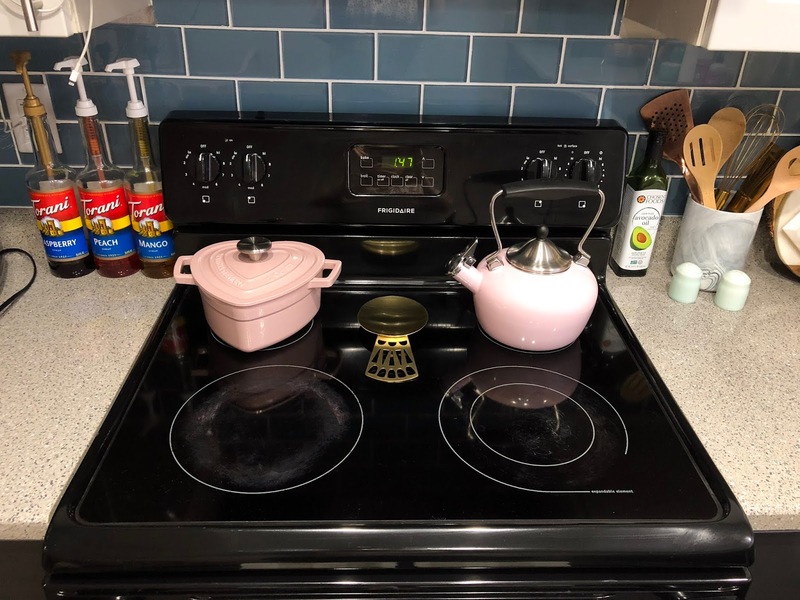 On the stove top, I like keeping cute cookware out for display such as this adorable pink heart-shaped cast iron from the Marth Stewart collection over at Macy's. 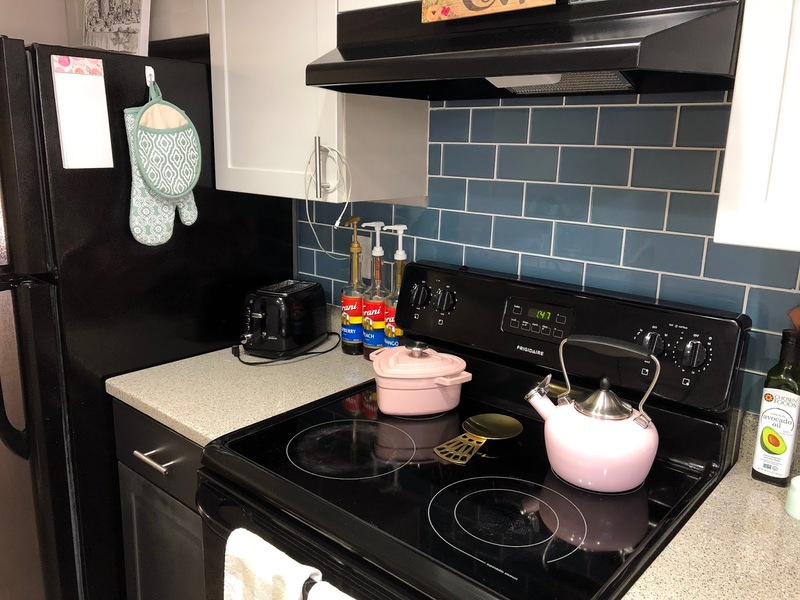 Then on the right a matching pink tea kettle, and in the center, I have a gold spoon rest from Anthropologie. To the right of the stove, I keep my avocado oil at arms reach since it's something I use often, and right next to it there's a marbled container with some of my "cuter" utensils. 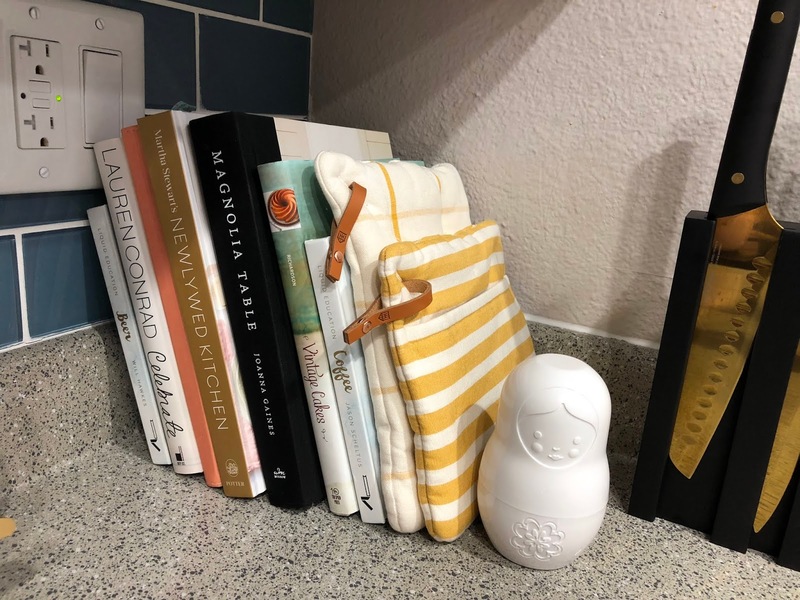 You may notice that I like to keep out only cute items, and what I'm always telling myself is, "If it's not Instagramable it's got to go" into the cabinets or drawers that is. In front of that, there's a cute matching marbled mint colored salt and pepper shaker that I purchased at Daiso. Moving all the way to the right corner area you will find a few cutting boards some that I use to cut our foods and others to display food on top of. On the very corner, I have all my cookbooks with two of my Magnolia oven mitts. Next, to them, I have my matryoshka measuring cup for display because she just looks so cute there and next to her I have my 13-piece gold cutting knives that I'm obsessed with. I knew when having my own place I wanted to have gold utensils and I searched so many places for good cutting knives and finally found some at Anthropologie. The last piece in this section is my cute little cactus plant. On the next wall, we have the sink, nothing fancy really. 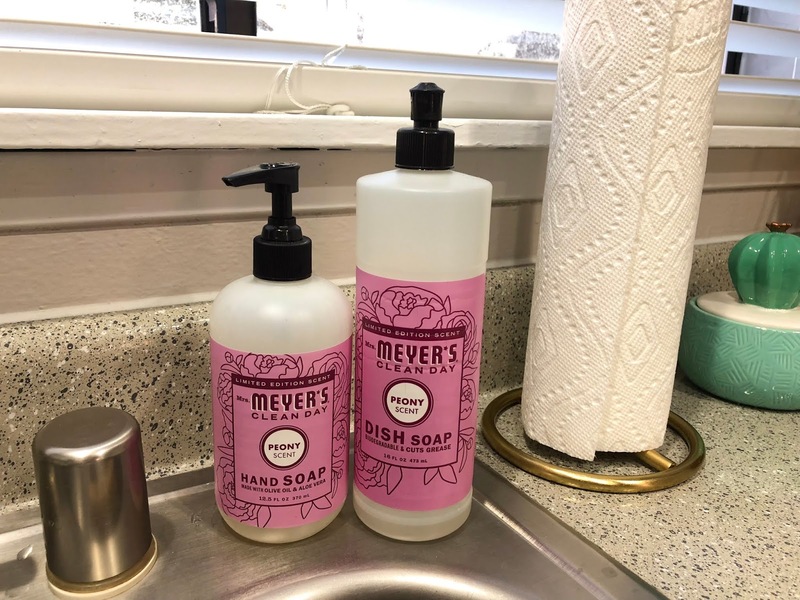 My favorite dish/hand soap brand is the Mrs. Meyer's ones and I have been obsessed with this peony scent! I even have the surface spray in this beautiful scent it's for spring and summer. 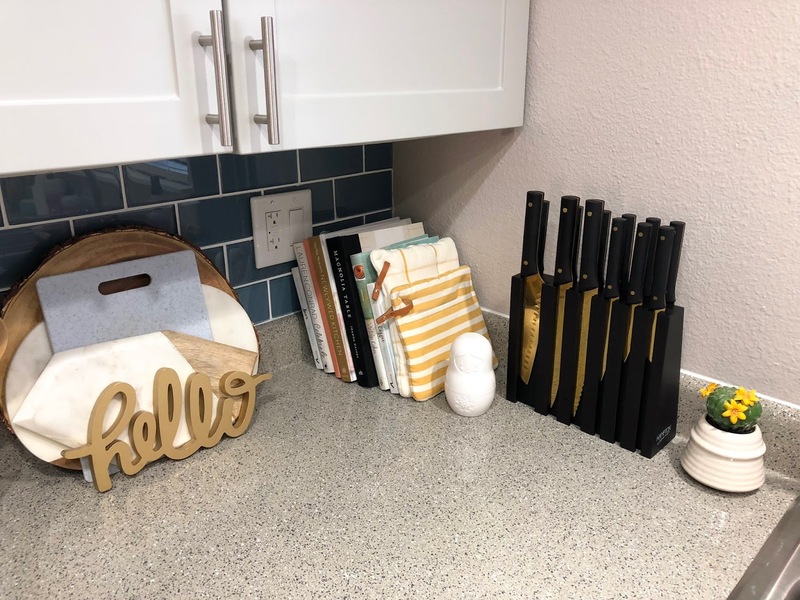 I have added touches of gold accents to my kitchen if you haven't noticed, and some more piece is this gold paper towel holder along with the wire gold fruit basket, both from Target. I really like the paper towel stand because it's heavy and won't fall over when you're trying to rip off your paper towels. 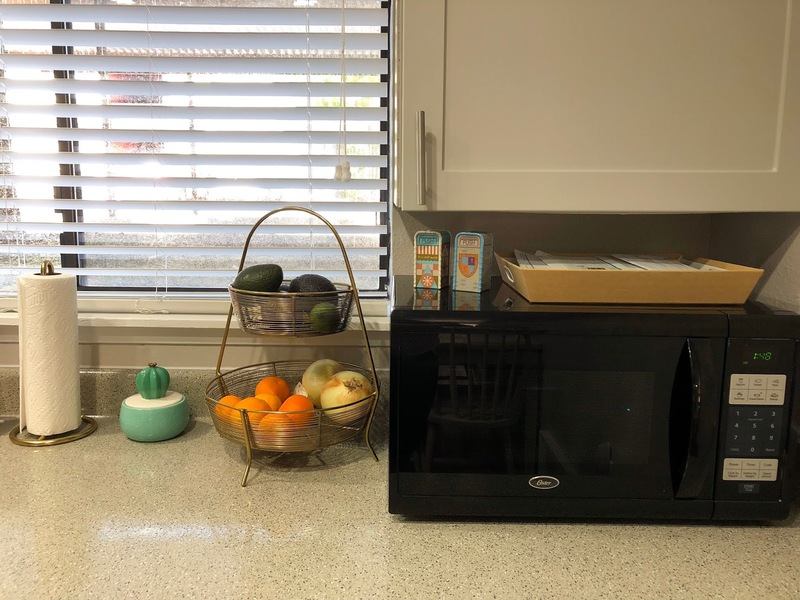 Next, we have a basic microwave and on top of it, I have a basket with some of our mail, mostly junk to be honest. 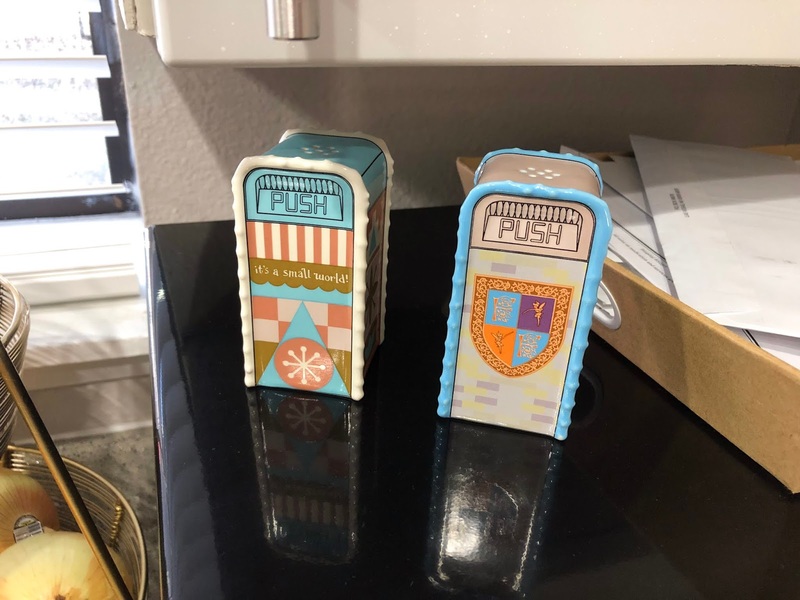 I also have this adorable Disneyland trash can shape salt and pepper shakers from Disneyland that I got a couple years ago. This is the final Disney items I have in my kitchen which I know might surprise a lot of you since I'm a really big Disney fan. I chose not to include too much Disney in my home because I'm trying to go for a different vibe. 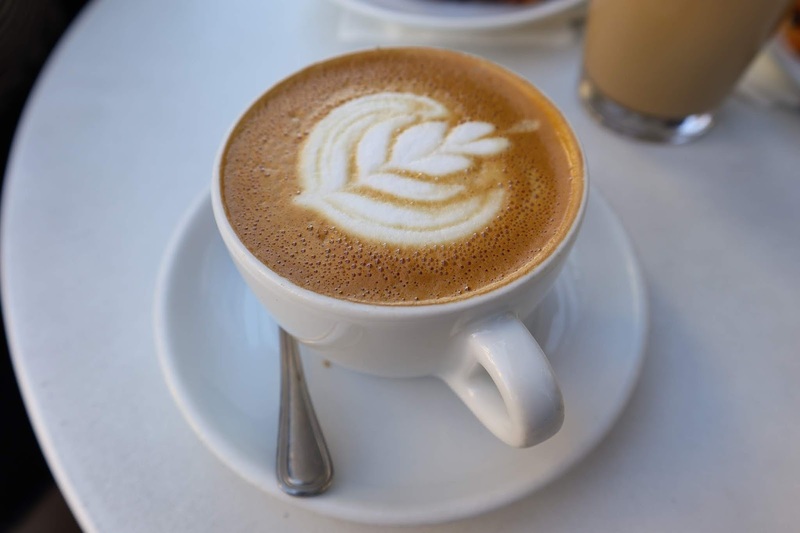 Although I plan on having small touches everywhere. Now on the last wall in the kitchen, we have the kitchen table. 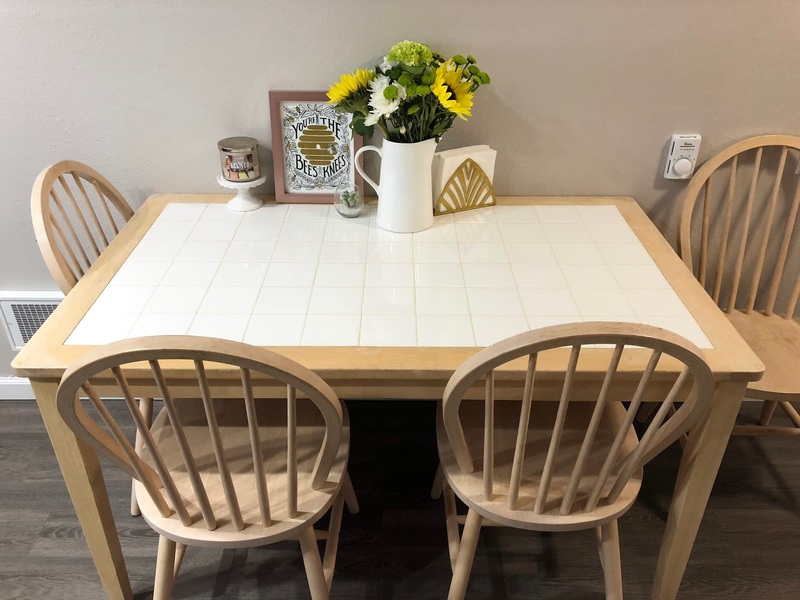 I've kept this side super simple and added a few pieces on top of the table to liven it up. I try to always keep fresh flowers in the house I just love displaying them in this cute white pitcher I got at Michael's craft store. On the right to it, I have a gold napkin holder, and then to the left of the flowers a baby faux succulent. I always keep a candle in every room and the kitchen is no exception. Lastly, I recently added this 'You're the bee's knees' print to this area. I have been debating whether or not to hang it because I have been loving how it looks displayed on top of the table. In the future, I plan on hanging either some pictures or art on this wall since we have a lot of play area. We have now reached the end of my kitchen tour. 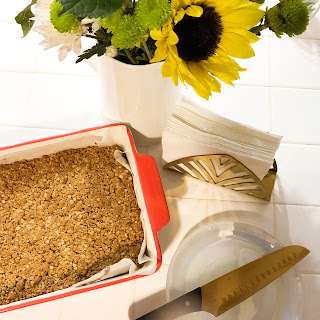 I hope you enjoyed taking a look into my little kitchen. 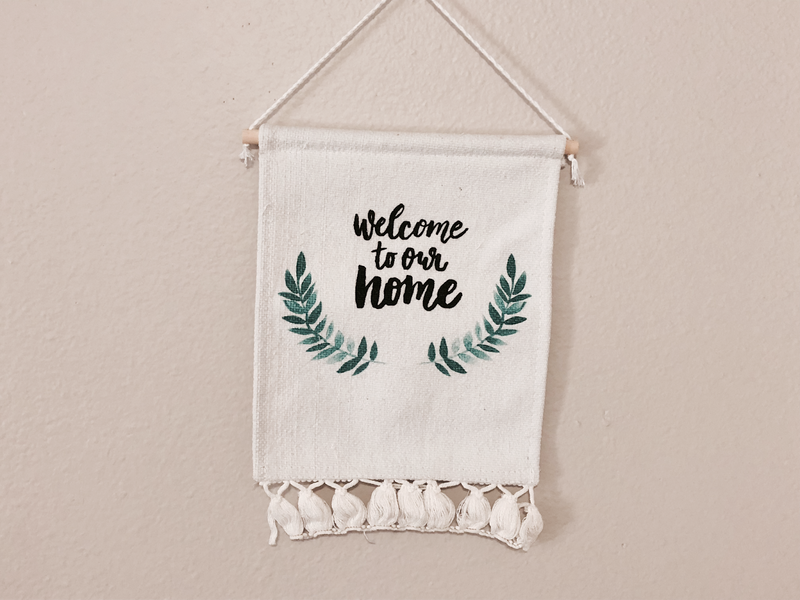 Please feel free to let me know what other home related posts you'd be interested in seeing in the future. 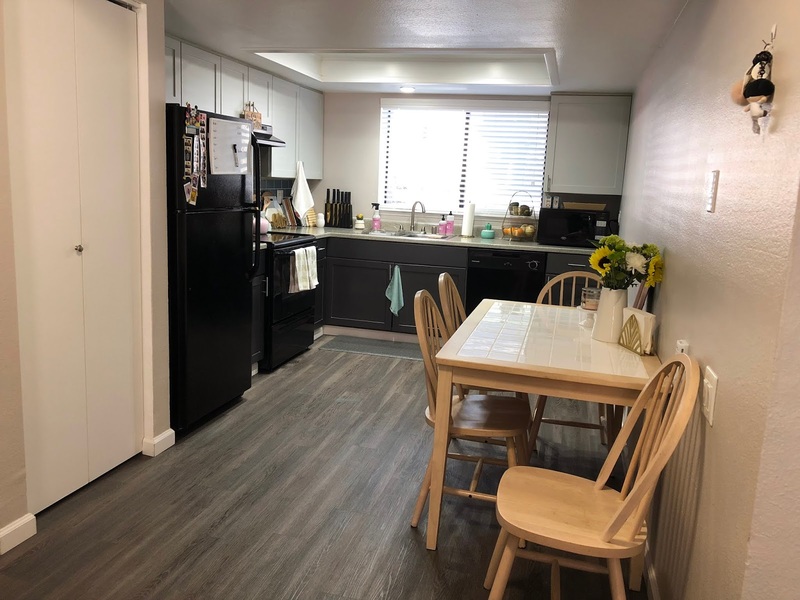 I love your kitchen! It all came together very nicely. I love all of the gold details, those knifes!! Thanks Imelda! I'm so happy I ended up getting those knives because they're wonderful, and so pretty. ive found rainbow utensils at UO that i want sooooo bad but im holding off on buying because im nowhere near moving out but i get the feeling! i have a stash of cups stored away in case i ever do move and have my own kitchen. and i cant cook to save my own life (at least not enough to warrant my own kitchen lol) but i get what you mean about having cute stuff to use. Thank you! I seen those utensils and I really liked them. I was tempted but I knew I wanted gold in my kitchen. Girl cooking is so easy, but I know what you mean. I used to not how where to start when it came to cooking. All if not most my recipes are easy peasy. I don't like complecated recipes.